Learn about how GiveGab and your Giving Day work together on the big day - and year round! We offer secure online technology inspired by the feedback of actual nonprofit users, resulting in features tailored to the most popular requests of those we wish to serve. This is why we provide custom plans and prizing to help organizations of all shapes and sizes find the right fit for their needs. All organizations using GiveGab for their Giving Day will always have access to their General GiveGab profile year-round! To learn more about the difference between general GiveGab campaigns and your Giving Day page, here are a few great articles that walk you through the differences! 3. Getting Ready for Your Giving Day! 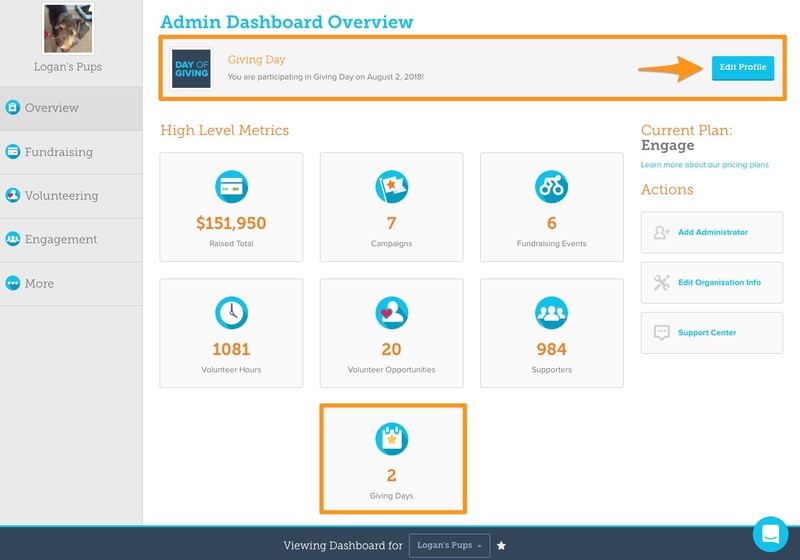 To get set up for your Giving Day, you can head over to your Giving Day dashboard and complete your Giving Day checklist to get all set up for the day! 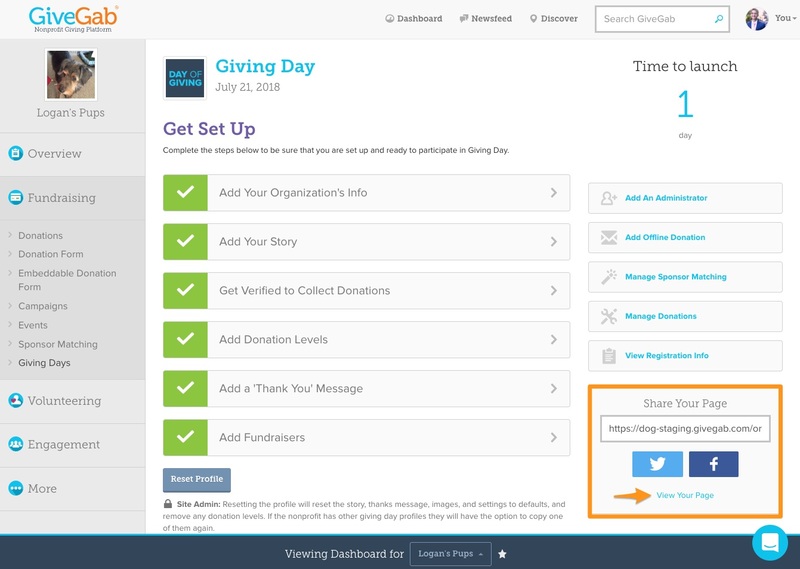 Once you have made edits to your Giving Day page via the checklist, you can head over to the "View Your Page" on the right to see your Giving Day page, and share the link so others can take a look too! 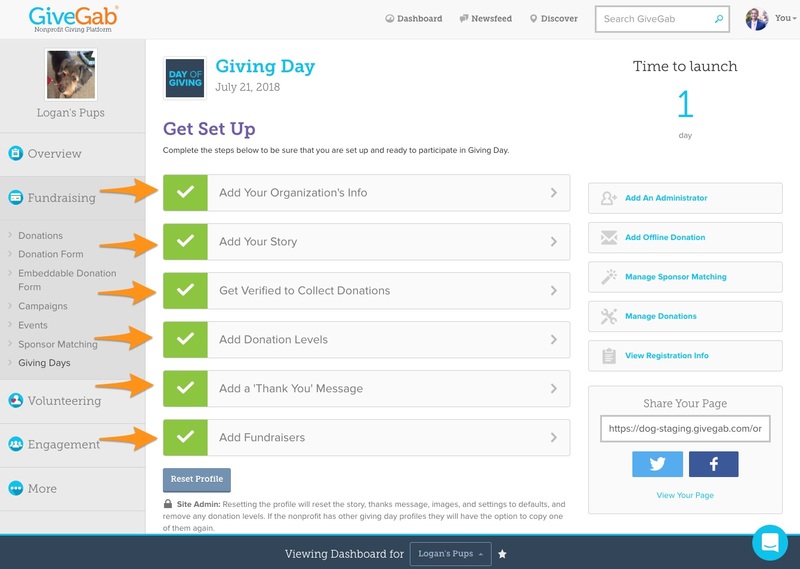 For some helpful tips on managing your Giving Day profile, check out these articles below! How do I Complete My Giving Day Profile? How can I Download a Report of My Donations?